I love seeing the book jackets set aside! That's a good idea! When I wrote my post up last night I was so tired I wrote a list of my notes and didn't reflect much. I need to go back and do that, I like how you wrote so many personal connections. It gave me more to think about. Thanks, Michele! It always helps me internalize what I read if I can make those personal connections and relate it to what I am doing in my classroom. I loved these two chapters. Donalyn's honesty is probably the most helpful part. It is nice to read the work of someone who doesn't feel like an expert, and admits to her struggles. I can't make a list of my canon either! I'm going to keep thinking about it though. I think a lot of us are probably thinking about the Reading Door! I like the way you made with with pictures. Several years I have sent a postcard home to my incoming students asking them to bring a picture of themselves reading over the summer, or to e-mail it to me (which greatly increased participation...does anyone print photos anymore?) I made a bulletin board display for the hallway during the first few weeks of school. I'm going to resurrect that idea. Thanks so much for commenting! I love that idea of asking kids to share a picture of their summer reading. Maybe that's how I can give my door a new twist at the beginning of this year! There is authenticity in Donalyn's writing. (And her presentations, too.) I know it is a characteristic that I appreciate greatly and part of why I find her books such reasonable resources. I love the idea of summer reading photos...I'm thinking about stealing that! I love this idea! In fact, I plan on doing this on my door in the Education Department at my university. I'm hoping to be able to 'nudge' some other faculty members to do the same! Great thoughts, Laura! I like your idea of involving parents more with the reading you are doing in the classroom and even educating them about what kind of reading is valued (all kinds!). What are the most effective ways you’ve found for communicating with families? Your reading door looks great! I think this is such a wonderful way to model for your students the habits of a wild reader, give them potential book recommendations, and show them the importance of reading across genres. Thanks! 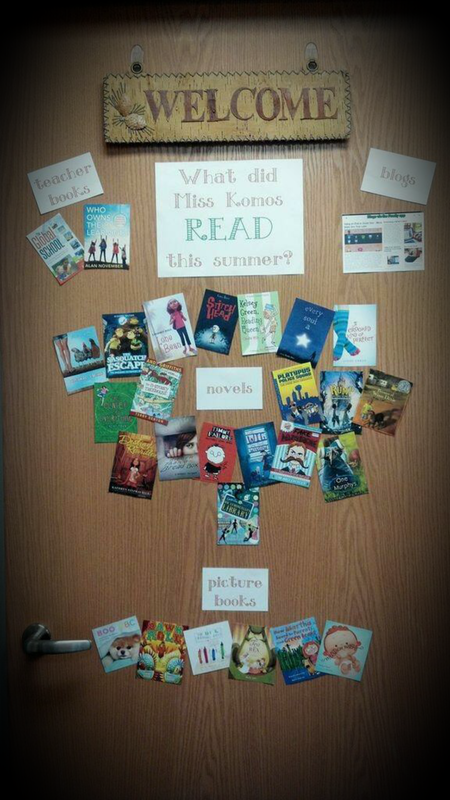 I love the way my reading door turned out last year and am excited to see how it evolves this year. It got lots of attention from passersby as well as from the readers in our class. I am still trying to figure out the best way to communicate with families. I've used a class blog and newsletters but am considering a private class Facebook page to see if that reaches more people. I'll be sure to blog about whatever I decide to do! Thanks! My reading door got a lot of attention from passersby as well as readers from our classroom. I'm excited to see how it evolves when I recreate it this year! Communicating with families is something I'm still working on. I've used a class blog and newsletters but am considering a private class Facebook page for the upcoming year in hopes that it might reach more people. I'll be sure to blog about whatever I decide to do! 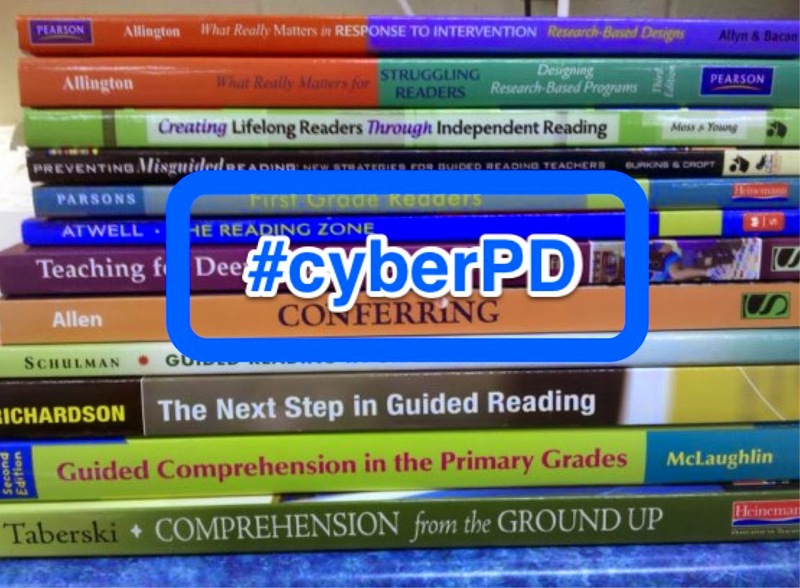 Thanks for sharing your reading door - I think it is great that we get so many glimpses into people's classrooms through #CyberPD. I hadn't thought much about reading series until I read your thoughts. I know how much I enjoy returning to the comfort of knowing a set of characters in a series and joining them on another adventure. It provides both tingly anticipation knowing there is a next book and a sense of accomplishment to finish one. I love, love, love the way you describe series books! That tingly anticipation is such a powerful force. I love being able to peek into people's classrooms, too! Thanks for the extra links and books here, too, Laura. I too like seeing pictures of different reading doors, and what you've already put into practice. I didn't write about the series ideas, but find that others don't like it when their students take all the reading time with series. Now I have a way to talk to them about that. Thanks for hosting! I've experienced that same thing with some teachers not valuing the power of series books. After reading Franki's and Donalyn's books, I now have shoulders to stand on when I encounter those naysayers! I have continued to be inspired while reading the next two chapters of Reading in the Wild. I am so thankful that we have the opportunity to create a culture of reading for our students that can change their whole perception of what reading truly is. I loved Donalyn’s idea of having a reading graffiti wall. I have bulletin board space adjacent to my classroom library that I would love to use for that purpose. Since I teach kindergarten, I thought about letting students share their favorite quotes from our shared reading experiences for the first half of the year and then encouraging quotes from their independent reading for the second half of the year. I also love the idea of creating a bulletin board with pictures to display what my students and I read over the summer. This coming school year, I am also revamping my Take Home Book system so that my students are setting their own short-term reading goals and developing their own reading challenges. I plan on modeling how I set my own reading goals and using our independent reading time to work towards those goals. I look forward to an exciting year of wild reading ideas being implemented into my classroom! Thanks for your high energy and enthusiasm for creating a culture of reading with your emergent readers! I also like the idea of the graffiti wall. I was thinking that Padlet or Lino might be good online tools to share 'golden lines' and favorite books. I can't wait to hear more about how you use this strategy with your kindergarteners! Great post this week! I love the piano teacher analogy! Thanks for sharing that! I also love the ideas that you shared with the book jackets(always an issue) and your reading door! I would really like to try that this year! I so agree with you! I read more books outside of my reading comfort zone because of my reading community, especially MG and NF books -- where I need more support as a reader! I also mentioned in several comments last week and in my reflection this week that we NEED to provide more parent/family support! Several us agreed to collaborate and create parent workshop ideas to foster the home-school reading community, as you mentioned. I need to implement the reading door! First of all, easy and awesome decoration, plus conversation starters with students and teachers! I have the sign outside my classroom door: "I'm reading ... Up next..." But the visual book covers (like Pinterest) will grab more attention! Thanks for hosting this week and for sharing your thoughts! I'd love to hear more about the parent workshop ideas! I bought a cute little chalkboard frame from Home Goods recently and am now thinking that might be a good spot for me to list my current read. Thanks for the inspiration! The dust jackets! Yes I agree they need to be on the books as students choose books, leaving them in the bin is a brilliant and simple idea. I'll try that this year. Love your reading door. I did one last year but didn't get to the point of having the kids make a classroom one. I want to try that this year. The 40 book challenge was a very good thing. I was amazed the number of students who made and exceeded the goal. Maybe we can push each other to make sure we turn over our classroom door to our students this year! I was also amazed at how many of my readers met or exceeded the 40 book challenge. Loved reading your reflection this week. The reading door is such a wonderful way to open up conversations about books. We also love the way Donalyn invites students to create a new reading door. So powerful! I couldn't agree more! It always amazed me to see passersby stop and ponder the book covers on the door. Conversations definitely were sparked from looking at those books! I even had some readers from other classes ask if they could borrow one of the books shown on my door! What a great model for the teacher to share what they are currently reading as well as reading along side the students! To have a space to share all the great reading taking place is a great idea with the reading door. http://alotalot.wordpress.com/-loved your idea to have students bring pictures of themselves reading over the summer to display. A great way to get the year started with reading enthusiasm. I look forward to trying this idea for upcoming year. I also think the idea of the reading door is fantastic and plan to do something like that on my office door on campus! I can't wait to hear about how you try this out in the fall with your first graders! I was thinking about using Pinterest as an online space to share 'books I want to read' and 'books I've read'. This can be another visual and digital way to share my lifelong reading habits and encourage others to do the same. Any ideas for integrating technology with your kiddos? Jumping in for week 2 and looking forward to see what everyone else is coming up with here! 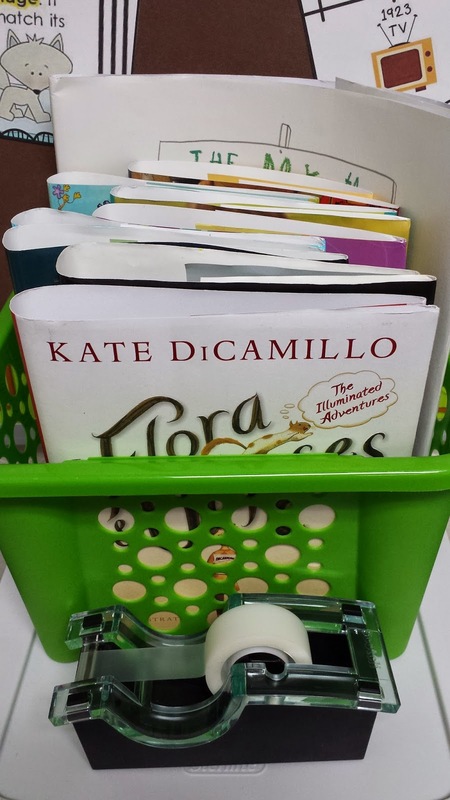 I'd love to hear more about how the 40 book challenge worked in your fourth grade classroom. I teach third grade and many of my students are highly motivated readers. I've always been anxious about doing such a challenge for fear it would place too much emphasis on reading completion over comprehension and encourage my "rush readers." Thinking back to what Donalyn wrote about, I think we can address some of those issues (rushing through books, fake reading, etc.) through our conversations/conferences with our readers. My 4th graders and I talked about the number but also focused on what it was doing to help them grow as readers. This year, I didn't have any genre requirements, but I'm reconsidering that for the upcoming year. I also allowed students to readjust that goal as they saw fit. Halfway through the year, my readers reflected on how they were doing with that goal and decided if they wanted to make it a higher number. (They couldn't go below 40!) It helped to give them ownership of that goal and pushed many of them to read way more than 40! I'd love to chat more with you about how it might work in 3rd grade. I agree! The conferences will help a teacher identify a faker pretty quickly. I also think a conference sets up a symbiotic relationship that discourages faking and rushing! I love how Donalyn has really capitalized on students' need for socialization and has made reading the thread that ties the community of her classroom together. Her commitment to being the "Lead Reader" in her classroom has inspired me to do a better job of reading the same books that my students read so that I can have more authentic discussions with them about their reading. The rich interaction between students and teachers that is created by sharing the experience of a book is such a motivator to get students to fall in love with reading. As she discusses required reading lists vs. students setting their own reading goals/ commitments/ plans, I love how she says, "You don't need a reading plan when someone else has one for you." That is so true. We need to encourage students to challenge themselves to read books that pique their own interests-- not to fulfill our list of "must reads" over the summer. Anna, I also find that line about reading plans to be really poignant. I think sometimes we believe we're doing our students a favor by keeping a line-up of books ahead of them. We can't always see all the unintended consequences of our good intentions! It's about ownership. We know we need to help students develop ownership-why not ownership of reading choice? Creating a community of readers is the most important thing we can do for our students. By sharing our own love for reading, we can ignite students to develop their own passion as wild readers! Donalyn states, "Wild readers develop their own reading plans and set reasonable goals for following through on them" (p. 157). I usually have my students keep a list of books they're read and books they want to read in their daybooks. Now I am thinking about incorporating apps like Good Reads and Pinterest to share these lists. Creating lists of books to read is a great start to setting reading goals but I also like to ask students to write out their goals in their daybook as well. These goals might include number of books or pages to read, exploring different genres of authors, or even committing to reading habits such as a consistent time for out of school reading. I thought the idea of reading resolutions is a great way to foster reflection on how they've met their goals thus far and what actions need to be taken moving forward to improve upon. What ideas do you have to help your students develop their own reading plans? Righto! If we want to help students continue to be avid readers after they leave our class, they must already have experienced avenues in which to access ideas for books. That's why I love the idea of Goodreads! Allows the conversation to keep going no matter where the students are! So much to think about and consider here. Like you, I think I still have some room to grow in improving my message to parents about supporting growing readers. This is something I'll need to think more about in the coming weeks. As a primary teacher, the dust jacket piece caused pause. The abuse my dust jackets take is immeasurable. I keep them on as long as I can to help protect the book and because the jacket often provides more information, but they do take a beating. I wrestle with this as some jackets, when removed, reveal a very unappealing cover unlike the jacket. I'm always trying to figure out the publishers that do this most often as I want to send them a letter to be sure the covers are as amazing as the jackets. I've often thought of laminating them and taping them down….well, good intentions do not cover books. Thanks for hosting this week. I'm enjoying reading the variety of perspectives as I travel from blog to blog. I'll be back to catch some of the readers who are commenting on the host blog only. I want to take time to read their reflections as well. It's a challenge to take it all in - the book, the posts, the tweets, the comments - but so worth it. One more thing, I'll be working to add posts to the jog over the next two days. I completely agree! Those colorful, eye-catching dust jackets often cover some unappealing, plain covers that wouldn't entice readers. In first grade, I never found a great way to combat that other than keeping the covers on for as long as I could. This year, more than ever, I'm finding powerful nuggets of wisdom woven into comments on each blog post! Maybe that's why I'm taking so long to make my way through everything. There is just so much to read and ponder - it's wonderful!! Thanks for hosting this week and for including a picture of your reading door! It will inspire me as I create my own. I agree with your thoughts about the importance of being lead readers and of promoting series books. I'm trying to read from a variety of genres this summer to be better informed as I give students recommendations, and I will definitely share my experiences implementing this goal with my students. Thanks for sharing your ideas! That is a big influence in my summer reading, too! I'm trying to choose mainly books that will hook my 4th grade readers at the beginning of the year. I consider boy readers and girl readers, the transition from shorter chapter books to more lengthy novels, and more! It's a big responsibility that I take seriously. Laura, I'm still thinking about the parent education piece of this from last week! I agree with you, we have to rally together and get all parties on board to really model the importance of reading. That's a great idea! Just another way to make contact with parents specifically regarding literacy. Also gives them the confidence to go into a book store or library with book titles and authors! Thanks for sharing! Conferring from the heart! I already love your post just from reading that one phrase! Can't wait to read more. Thank you for hosting this week, Laura. I couldn't agree more with your comments about being a lead reader. It is very frustrating that most teachers I know do not read professionally, personally, or books for the classroom. Sometimes I feel strange reading such books as the Penny series, but kids love it during a reading conference when I share my favorite part or tell something I noticed between two of the books in the series. I enjoyed reading your reflection on reading books in a series. I often forget this is a pathway to growing wild readers, especially in second grade. I too loved your comment: "We have a huge responsibility as the lead readers in our classrooms!" and your analogy to the coach. My post (forthcoming) is focusing on this very fact! Thank you for your thoughtful insights and for keeping the conversation going. I cannot imagine being a reading teacher who doesn't read. Plain and simple. We have to continue to keep doing what's best for our kids! Establishing reading communities for our students is imperative because it fosters relationships through sharing books and reading with others. These communities need to exist in the home as well so students can realize that reading is valued by our culture. Donalyn suggests that reading communities “enrich their [students’] lives and their reading experiences” (p. 97) because students are learning from one another which encourages them to become autonomous readers. I love how Donalyn shares her book challenges with her students – it motivates them to join her and accept the challenge alongside her! I think they are encouraged to read the books with hopes of discussing them in class – who wouldn’t want to share their thoughts on books they read with others? Again, she is creating a reading community for her students. Even though I teach 8th grade math, I plan on telling my students about my book gap challenge (which is to finally read Wuthering Heights) as a way of establishing a reading community with them, but more importantly, wanting to have an open relationship with my students where they feel comfortable to talk with me about books they enjoy and books they would like to read. Hopefully, just by sharing my personal challenge with them we can attack our book gap challenge together and share books! I appreciate Donalyn’s many wonderful, creative ideas! I wish I had a teacher like her! I was excited to read about the Newbery Award challenge...I've always wanted to start checking them off my list. Funny to hear that she found the first ones so dry she stopped. Makes me want to alternate a recent book with an older one :) Let's talk before class about Wuthering Heights! Thanks to Donalyn, I’m already writing down items that I’m excited about trying. She suggested multiple ways to share students’ book recommendations so that they are more meaningful and reach a wider audience. Reading doors allows students to develop displays to showcase their reading to the rest of the school. Using their suggestions, the teacher could share these through their weekly newsletters whether printed or online. Individual book reviews written by students could also be shared through the newsletters. While it’s not a guarantee the parents will read the newsletter, when a student’s review is included, the child will be more likely to show the parent. Also, it’s a powerful way to keep the parents informed about the real reading and writing that’s occurring in the classroom. With Amazon and Barnes and Noble online book reviews, students can write reviews that will extend beyond the classroom. The fact that these review sections exist provide the students with an authentic purpose for writing their review while also validating their voice as a reader. Review sections are no longer just for the newspaper with prior approval, but a space for anyone and everyone to share their thoughts! I also look forward to using GoodReads! If the goal is to help support the students to become avid readers that will continue well after our year together, then GoodReads could be a wonderful opportunity for them to keep track of their accomplishments, never be at a loss for recommendations, and continue the conversation with established reading buddies even if they are no longer in the same class, school, or even state. Plus with the ever increasing emphasis of incorporating technology into our classrooms, this is one site/app that I’m eager to share and use in my classroom.